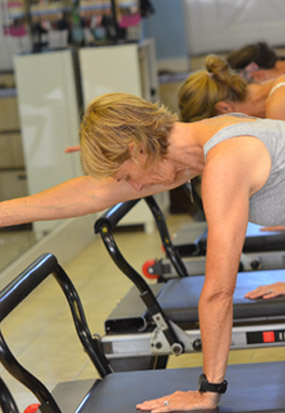 Barre workouts are becoming a more and more common sight in Pilates studios across the nation! The elegance of the ballet style moves and the intensity of the workouts are a perfect fit for women seeking to double down on problem areas, like their upper arms, abs, and leg muscles. Are you thinking about stepping up your game and trying Barre Pilates? Here are a few tips to get you ready for your first class! Make sure you are dressed appropriately. You might work up a bit more of a sweat in a Barre class, so use layers – if your studio is chilly, a wrap or light sweater can keep you warm until you get your body temp up, and leg warmers were invented for a reason! Bare legs and feet aren’t the best option. Use Pilates or Barre work socks with friction lines on the soles, or wrap shoes. Wear long, tight leggings, or capris that extend well below the knee. Eat before class! You’ll be burning serious calories, so try for protein like eggs or cheese – an omelet for breakfast is ideal. Don’t be shy. Get up front so you can’t see the other participants, and focus on the instructor instead of comparing yourself to more experienced people in the class. Don’t be scared if you “shake” after class. That’s the goal – to exercise the micro-muscles in your body and force them to keep going after class. Soak after class! Your body will feel airy and light after the tension of the workout, but a good long bath will keep you from being overly sore the next morning. You want to go back, so don’t let your body talk you out of it! On that note, don’t stop! Persistence will pay off, so don’t give in after one class. Show up for your next one even if you have to drag yourself in and set a slower pace. Your body will learn to keep up, and the results of Barre work are worth it!